- Tangled Threads -: Tea.......and a shout out to the Lion Brand Yarn Company! Tea.......and a shout out to the Lion Brand Yarn Company! I just had to share a wonderful email that I received. Those of you who are regular readers may remember my heartache over the baby blanket that I had started (click here if you have no idea what I'm talking about !) I have to make it very clear that the fault was all mine....a rookie mistake if ever there was one! I had not purchased enough yarn to complete the project and the new yarn I bought on-line was completely different. Anyhoo, I received a wonderful email from the Lion Brand Company from Ben who has probably the most enviable job ever....he interacts with bloggers from the crafting community! Sweet job, Ben....I'm rather jealous! He contacted me with the offer of sending me replacement yarn for the project or a project's amount of any other yarn from their site! Talk about great customer service :) I'm totally over the moon with this offer from them. I love the original yarn and really would like to finish the blanket using this yarn as I think it's just a tad different for a baby blanket. Anyway, since we usually only hear of complaints and bad service, I wanted to highlight great customer service. Thanks Lion Brand....you rock! Hopefully I will be soon able to show you, dear readers, a completed crochet baby blanket using that gorgeous multi-coloured yarn! ...a bit of a grey day, so the lighting isn't too good. ....and with an empty teacup so that I don't have another panic attack! 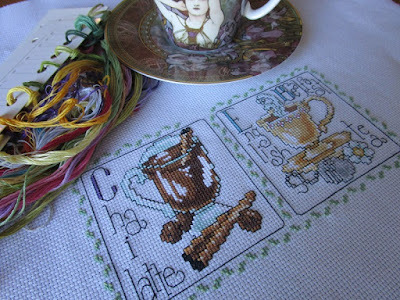 This sampler seems to be stitching up pretty quickly! That's absolutely awesome that you'll be able to get a hold of some yarn. Also your tea is looking awesome. 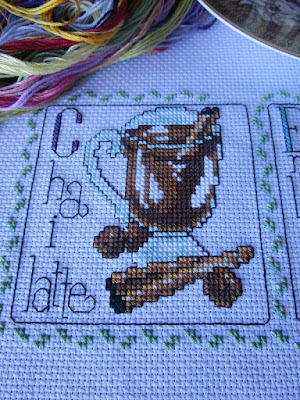 That's My favorite treat tea a chai latte. I'm really glad that Lion is able to help you with your yarn problem. There are still some caring, helpful companies out there. My mom collected teacups and I've always wanted to, but never had a place to put them. I'm enjoying seeing yours though and I agree that an empty cup is better than a full one in this case. So nice of you to talk about good customer service of Lion brand. The chai latte looks lovely. Well done Lion brand, awesome to hear of good service like that. Will definitely keep that in mind when yarn shopping. 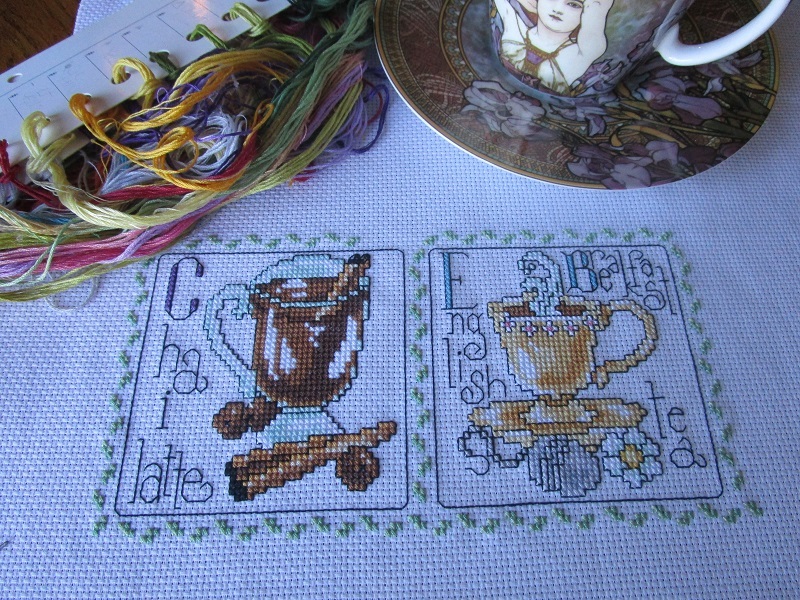 Great finish on the next piece of your tea sampler. I giggled when I saw the cup wondering if it was empty. Hi Rhona. What a nice surprise to receive such an offer. That's the way to please customers and make more want to order from you. 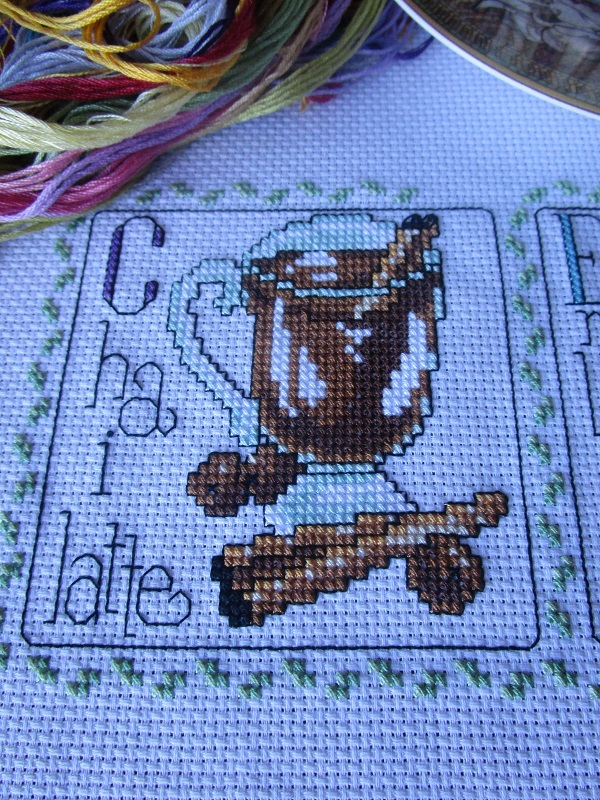 I love your cross stitching. Love the colors. Great job. That's great news !! Lovely stitching on another block. Great new tea addition, Rhona. And what a helpful company Lion Brand is. You do not always get such great customer service. Good to hear that Lion Brand have such great customer service...that is so important. Love your tea design, it's looking very stylish! Wonderful news Rhona. And a wonderful post. Your tea blocks looks really tasty. I love your latest tea block - these are really sweet motifs! Good to hear that there are still companies with great customer service out there. What excellent customer service! Nice to be able to praise a company. Nice new teacup and an empty cup is much less dangerous too. Yay good news! Looks great!